With only 3 more weeks left in standard Yahoo Fantasy Basketball Head-to-Head Leagues and managers still battling for playoff position, I thought I’d take a shorter-term focus and look closely at 5-8 players that I think are primed to do particularly well in NBA Week 19. I used two excellent tools from Fantasy Basketball Monster–its Schedule Grid and its NBA Ease (Team Difficulty) Rankings— in conducting this analysis. Consider three points that illustrate why many of the Bobcats’ young players are strong pickups this week. Point 1: Jeff McInnis was waived on Friday. Point 2: Gerald Wallace is out recovering from his fourth concussion with the Bobcats. Point 3: Coach Sam Vincent has said: “We want to look at our young guys in tough situations, see what we have.” What does all this mean? Players like Matt Carroll are going to get ample playing time to prove what they can do. Even better, the Bobcats are playing 4 games this week and the competition isn’t particularly fierce: @ Min on Tue, GS on Wed, Atl on Fri, @ Was on Sat. Strong recently. Carroll in particular has been particularly strong of late, showing what he can do with more minutes. He started at shooting guard Friday night against Boston and played a season-high 36 minutes, scoring 16 points on 4-6 shooting from beyond the arc, with 4 boards, a steal and a block. He scored 19 the game before on 8-11 shooting. This guy can flat out shoot the 3 and doesn’t seem to have much of an Achilles heel. Owned in 1.8% of leagues. Began starting in February after significantly improving his game in January, Mohammed has been an inconsistent player all season. But with the new look Bobcats with fewer and fewer options, Nazr has been getting some quality playing time (7-10 more minutes a game than his season average, the last 3 games) and has been doing a fine job on the glass and shooting from the field. Easy competition? Fantasy Basketball Monster rates the 4 team’s the Bobcats will be playing this week as particularly “easy” to score against (fantasy-wise) if you are a Center–so pick up Mohammed if you’re in need of a big man this week! Owned in 6.0% of leagues. Golden State is playing a relatively easy FOUR games this week, as well. Their opponents (Miami, Charlotte, Orlando and Atlanta) are relatively “easy” to score against from the Forward position (especially Miami), so Mickael Pietrus is an ideal pickup for those looking to improve in points, 3PTRs and steals. Amazing game on Friday. Pietrus’ last game epitomized efficiency. In only 22 minutes Mickael scored 23 points (yes, more points than minutes played) on 7-7 shooting (3-3 from 3ptr) along with 2 assists, 2 rebounds, 1 steal and 1 block. Owned in 1.5% of leagues. As if Carroll and Nazr weren’t enough, I’ll put my neck on the line even further this week and say Jared Dudley is a third strong pickup from the Bobcats. Dudley isn’t a prolific scorer, but can give you production in nearly all categories. His minutes rose substantially in February amid the chaos in Charlotte described above. The minutes are only increasing further in early March. Most recent game. 9 points, 7 rebounds, 3 assists, 3 steals in 27 min. Owned in 0.2% of leagues. I packaged these guys together because I can’t decide who’s the better pickup this week. So I will let you decide! The facts: Oberto has started for the Spurs, but isn’t putting up amazing stats. Thomas was brought over from Seattle to do just that, but Gregg Popovich has been extremely hesitant in changing up his rotations (this has affected Damon Stoudamire as well). I’m optimistic Thomas will get more minutes in Week 19 because the Spurs are playing four games this week against teams that love to run: Indiana, Denver, New Jersey and Phoenix. I’m also optimistic either of these two has the potential to do really well because the aforementioned team’s DO NOT PLAY DEFENSE. Pop’ will have to begin breaking in Thomas this week if San Antonio wants to do well. K. Thomas this year. 7 points, 8 rebounds a game. Owned in 15.3% of leagues. F. Oberto in February. 6 boards a game, 58% shooting from the field. When he returned to the NBA, Webber said to give him 5 games or so before judging him. Well I’ve given him eight and it hasn’t been pretty CWebb (you can see my incorrect predictions here). BUT despite the initial struggles, I am still confident Webber will begin producing the conditioned he becomes. Week 19 would be the perfect week for him to elevate his game because of the “weaker” Eastern Conference competition (Mia, Char, Orl, Atlanta) and the fact that Miami and Charlotte both poorly defend Forwards of the opposing team. Signs of improvement? In his last game against Philly, CWebb had 8 points (4-6 shooting), 7 boards and 3 assists in 18 minutes of play. Owned in 4.0% of leagues. I’ll admit this one is a stretch–Zaza Pachulia has been an inconsistent player this season coming off the bench. 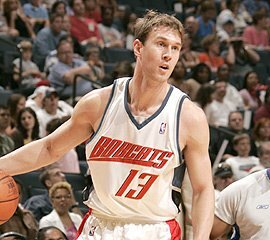 But amid the troubles in Atlanta, he’s still the 2ND GUY coming off the bench after Josh Childress. And not only that, but the Hawks play Golden State, Miami and Charlotte before a tough game against New Orleans this week. Those three team’s defend terribly against opposing Centers and give up a lot of points. Zaza’s not looking so bad this week after all. The 2 sides of Zaza. In his best game recently, Zaza had 12 points and 12 boards against the Clippers. In his worst game (his last), he scored 0 points in 12 minutes. Owned in 0.5% of leagues. Let Mike and I know in the comments who you think is a good pick up this week and if you agree with those listed above. For weekly pickups until the end of the fantasy season, subscribe to Fantasy Basketball Pros’ RSS feed.